Religion means a way of life. The religions of the world are the different paths to reach God. Each religion has laid down a unique mode of worship, tenets, and tradition. But, Baba did not take note of these rules and regulations. He discarded them as man is not born for the sake of religion and rules. He exhorted that pure love is the easiest path to reach God, who is the embodiment of love and the law of love is greater than all religions. The religion of Baba, is to love God and all beings, which are nothing but His manifestation. It is enough to have a loving heart so that we could share our love with others and get loved.True love satisfies the hunger of any creature, wipes out the tears and cares for the needy. 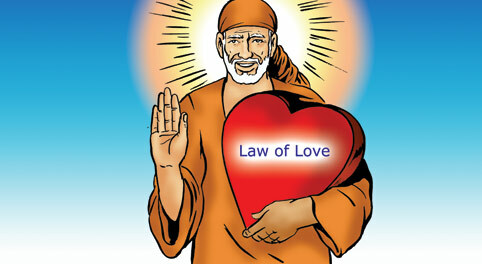 It is the divine mission of Sai to shower His love on all. Rule of law, justice and moral conduct are all meant to help keep society in order but should not cause even the slightest harm to any creature. If we behave cruelly and unjustly against any living being, God will not appreciate us despite our social service and religious prayers or rituals performed. Love is superior to law. Law will punish, but love transforms and paves the way to reach the Supreme Soul. We, therefore, should always remember the saying of Baba, "love all beings and be merciful". That should be our religion of love.